What is the Ancient Agora of Athens? The Agora is the birthplace of Democracy, a unifying monument for humanity and a great symbol for peace, progress and Freedom. It was here that great philosophers like Socrates and Plato taught and expressed their views on issues of creation, morals, and aesthetics, while debating with the Sophists. Great rhetoricians like Demosthenes and Isocrates charmed the citizens with their elegance of rhetoric. In the Agora, great politicians like Pericles expressed their political views and led the people to glory. Important figures of the law passed down judgment, clerics worshiped the gods, and citizens had the power to meet, vote and directly choose their own destiny. The Agora is the birthplace of Justice, Equality of Speech, Equality before the Law, Freedom of Speech, Debate, and Democracy. 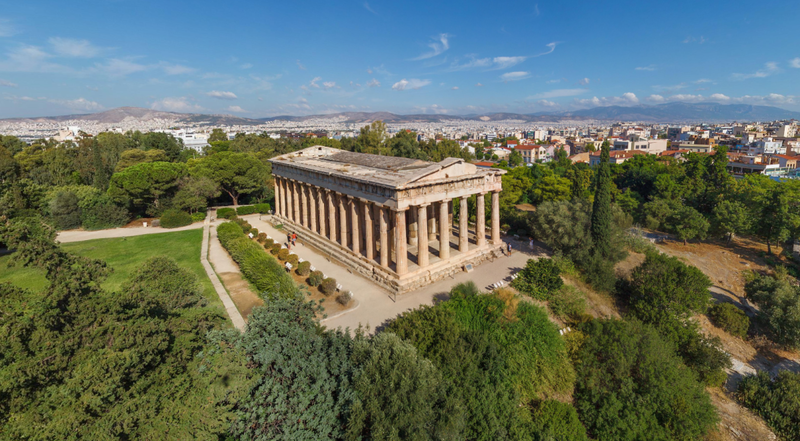 Today, the Agora lies at the central of the city of Athens. The “American School of Classical Studies at Athens” is responsible for its reconstruction and conservation. What is the Leontida Foundation going to do exactly? This project is going to take the first important steps towards the reconstruction and restoration of the Ancient Agora of Athens. To this need, we will need to create a bundle of materials to raise awareness and present the Agora’s case globally. This will include a detailed, architectural model of the restored agora, a fully 3D-animated presentation video that will guide the viewer through the restored Agora, a professionally directed video presentation, and the necessary literature material. Has such a project been undertake in the past? Yes. 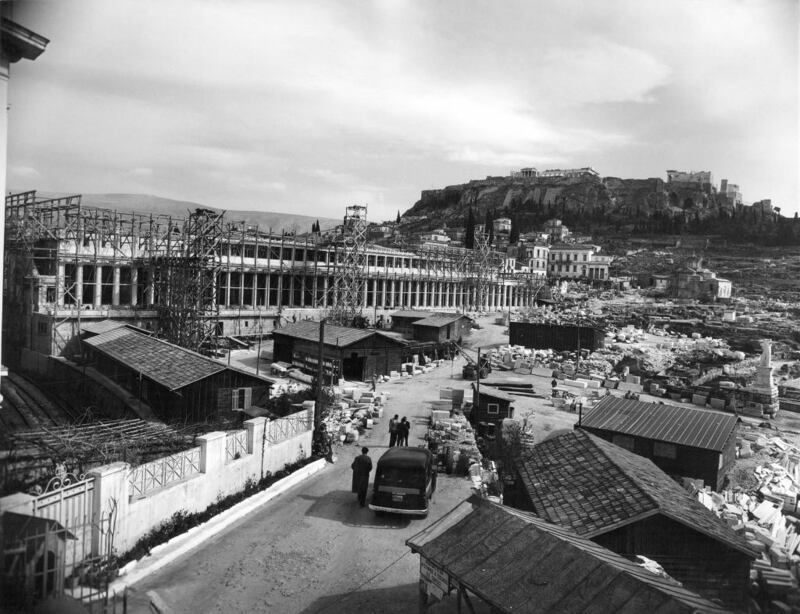 In 1956 the American School of Classical Studies reconstructed the Stoa of Attalos, with funding donated by the Rockefeller family. What will the restoration mean for the Ancient Agora of Athens? This unique monument was supposed to be the center of the polis of Athens, but it has been degraded to an open-air museum. We, the lovers of freedom have a duty to restore the Agora as the heart of Athens and the heart of the glorious idea that is Democracy. 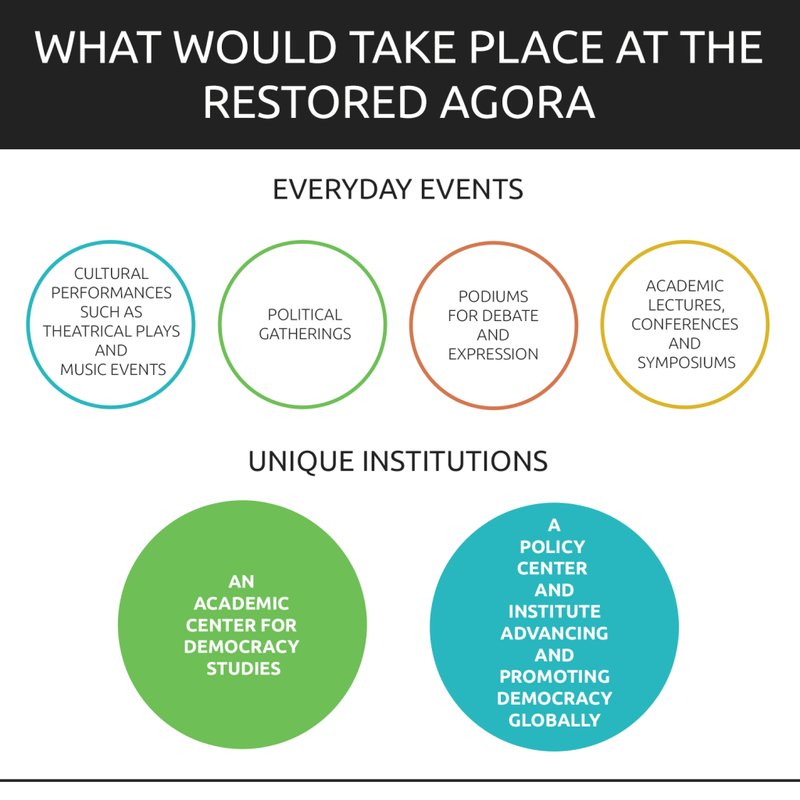 By doing so, the Agora will constantly be open to the public to accommodate various cultural performances such as theatrical plays, political gatherings, music, academic lectures, conferences and symposiums. At the same time, it will provide a constant, free and direct podium for every active citizen to express his opinion and debate with his fellow citizens in the Agora. The restored Agora will call on every citizen from across the world to participate in events that promote human progress, creativity and democratic ideas. What will the restoration mean for Athens? Athens is the birthplace of Democracy. By restoring the living monument that is the Agora, the city of Athens will become a democratic beacon once again. Its citizens will enjoy a healthy center for debate and dialogue that will increase participation in public issues and will produce active and involved citizens. At the same time, the quality of life in the metropolitan center of Athens will increase for residents and tourists alike. What are the goals of this project for Greece? This project will empower Greece and reinstate the ancient land to its rightful place as the mother and preserver of Democracy. The restoration of Agora will create a universal and unifying symbol for Democracy and progress for all humanity. Greece will enjoy huge cultural benefits. The Agora, being the center of Democracy will host numerous cultural events such as theatrical plays, political conferences, academic lectures and symposiums. Tourism will reach to new heights, as the restored buildings of the Agora will be a wonder to behold for every visitor. The heart of Democracy will also be the beginning for a new “Democratic Trail” that will lead the admirers of this great and high ideal to a deep understanding of the Western world and heritage. The economic gains of such an endeavor are obvious and could point a way to a lasting growth and prosperity. Finally, the political benefits will be tremendous. Greece, will take it rightfully upon itself to promote and advance Democracy for all humanity. Promoting Democracy will include new democratic ideas, processes, methods, e-Democracy and new and progressive ways of living and participating in the political life of a contemporary and modern Democratic state. This mission will envelop Greece in a “Shield of Democracy” that will elevate the country to the status of a major Democratic Power. What are the global goals of this project? At its essence, this project is universal at its scope. The benefits of the restoration of the Ancient Agora, the birthplace of Democracy, are truly universal. The new and emerging trends and advancements of Democracy, such as direct ways of democratic participation and e-democracy, as well as the restoration of Democracy to its true values, will benefit citizens across the world. The democratic values express and correlate with the noble human traits of participation, self-determination, tolerance, liberty and freedom. It is these traits that unite humanity and inspire us to greatness. It is these human traits that make the world a better place. Furthermore, the oppressed, our fellow citizens of the world that seek their freedom, will have a power to guide them to the splendors of Democracy and stability. The world will benefit from a major force promoting Peace, Freedom and Democracy.